Nestling on the northern shores of this stunning island get away, looking out to the neighbor island of Koh Phangan you will find the serene beaches of Ban Tai. From the moment you step through the beautifully carved double teak doors and make your way past the pool to the villa a feeling of relaxation, space and the ultimate in luxury and privacy will prevail. Villa Chok has been thoughtfully designed and equipped with the highest quality designer, custom made fixtures, fittings and furnishings. 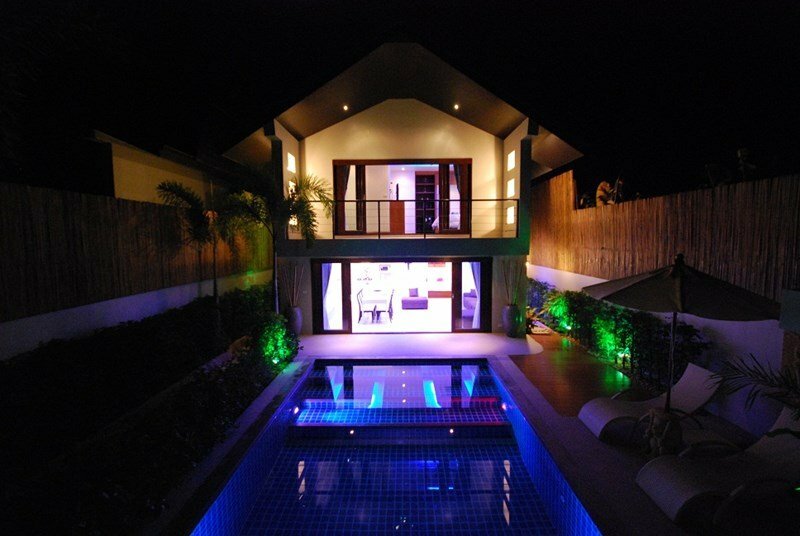 The stunning flood lit private pool is surrounded by a tropical plants and trees. Open the double doors to the spacious living and kitchen area and you can enjoy open plan, open air living in your own personal tropical paradise. Beyond this area is a stylish double bedroom with a private terrace and is accessed by large double doors that when opened give you a stunning view of the pool and gardens. The downstairs bathroom is a work of art and features a large bath, ample storage space and internal access to the second floor that can also be accessed from the garden. The second floor has two large and tastefully decorated double bedrooms with semi open plan en-suite bathrooms and one has its own private balcony overlooking the pool. Each of the three bedrooms has wifi and on the living room a wide screen televisions for your entertainment plus the 3m outdoor cinema at the pool area. The beach is only moments away from the villa and a great choice of shops, bars and restaurants are to be found locally.